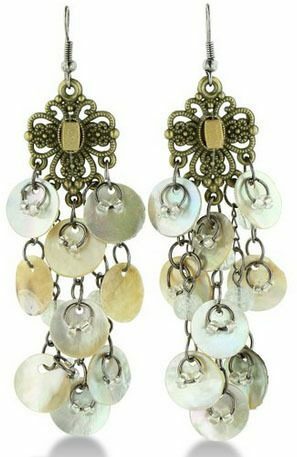 Gold Tone Filigree Chandelier Earrings Only $7.99 (Reg. $50) + FREE Prime Shipping! You are here: Home / Great Deals / Amazon Deals / Gold Tone Filigree Chandelier Earrings Only $7.99 (Reg. $50) + FREE Prime Shipping! Oh my goodness – how gorgeous are these earrings?! Right now, you can grab these Gold Tone Filigree Chandelier Earrings for just $7.99 (reg. $50)! And, you’ll get FREE shipping with Amazon Prime or Super Saver Shipping! These would make a great gift for someone or a nice treat for yourself! A lovely swirly gold tone pattern drop earring is accented with a gold tone barrel bead and finished with oodles of shimmering brown discs and white beads for a lavish look. These exquisite 3 inch drop style earrings are colorful, bouncy and can instantly (and inexpensively) turn a simple outfit into one fit for a night on the town!